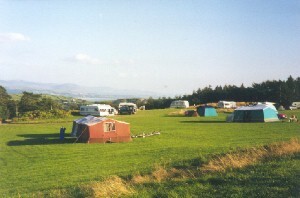 Eisteddfa is set in an idyllic area for you to enjoy a peaceful and relaxing holiday. The park is within a very scenic resort, with many amenities to suit everyone, (beaches, mountains, pony trekking, lakes, fishing, slate caverns, Ffestiniog railway, Portmeirion, sailing, etc., etc.) all within easy reach. You can also visit the birthplace of David Lloyd George and explore his life in Llanystumdwy. The park is set within 11 acres and is positioned in a very picturesque area, with spectacular views overlooking Cardigan Bay as well as panoramic mountain views. There are plenty of public footpaths surrounding the park for the fit and adventurous. The park is situated on the A497, just 3½ miles from Porthmadog and 1½ miles from Criccieth. Criccieth is the nearest town, just a 15 minute walk, with shops, petrol stations, public houses, cafes, restaurants, beach and post office. Criccieth Castle is always worth a visit as the views around the bay are breathtaking. Also you cannot visit Criccieth without tasting the famous Cadwalladers ice cream. Tent and Touring Caravans are welcomed. There are level areas for both Tents and Tourers, also 35 electric hook-up points. Modern toilet block, with WC's and showers. We aim to keep our toilet blocks clean and tidy at all times. Electric shaver point and electric point for hairdryers are provided. Hot water is in constant supply. Washing and drying facilities are available. Telephone on site. Mains water points throughout the site and elsan disposal. Dogs are permitted, but must be exercised in designated dog walks or off the park. We are a family run site and look forward to making your stay with us a happy one. Directions from Porthmadog Go through Porthmadog, to roundabout and turn left on the A497 towards Criccieth. Follow this road for 3½ miles, through Pentrefelin, take 1st right after the Plas Gwyn to "Eisteddfa Caravan & Camping Park". Then take 1st left into the park. Reception is at the Lodge as you turn right.